One of the ten films screening in the 56th BFI London Film Festival's Official Competition for Best Film, 'Ginger & Rosa' is the latest feature from revered British writer-director Sally Potter, starring the likes of Christina Hendricks and Annette Bening. Her sixties family period drama tackles sexual awakening amid the fear of nuclear holocaust but ultimately fails to inspire or enlighten. The setting is London, 1962. The Cold War looms. Teenage girls Ginger (Elle Fanning) and Rosa (Alice Englert) are best friends, seemingly forever. School is a side thought, with their politics and romantic exploits steadily taking an increasing role in their lives. Their political and sexual revelation soon find themselves at odds, as do the formerly inseparable duo. Considering this is a British period drama, written and directed by a Brit, the number of Americans in the cast is surprisingly disproportionate. Their accents are delivered adequately enough, and their performances are fine, but the dominance of the American cast is somewhat jarring. As is Elle Fanning's periodic crying in the final third of the film, each tear more ineffective than the last. Fanning admittedly does the best with what she's given, and is (at) the emotional heart of 'Ginger & Rosa' but her permanent state of sadness and confusion toward the end of the film becomes increasingly uninteresting. In many respects, her tragedy is matched by Rosa - an excellent introductory performance from newcomer Alice Englert. Elle Fanning and Alice Englert clearly have a bright future ahead of them but 'Ginger & Rosa' doesn't particularly work as a coming-of-age film or a melodrama, merely passing along for its ninety minutes running time. Moments of interest are sadly fleeting, and we can hope Sally Potter's next film is more invigorating. 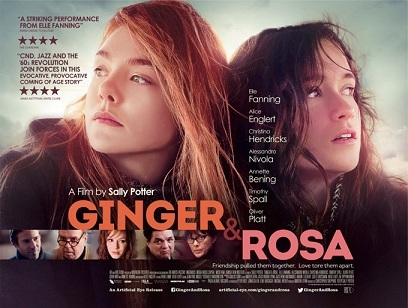 'Ginger And Rosa' is out on Friday in UK cinemas, through Artificial Eye.